The emergency is for areas around Valley, west of Omaha, between the Platte and Elkhorn rivers after a levee failed on the Union Dike, the National Weather Service said. The Omaha-Valley weather service office said it was evacuating its personnel. Nebraska and other parts of the Midwest are coping with heavy flooding this weekend in the wake of a powerful “bomb cyclone” as well as from the natural snow melt during spring thaw, forecasters said. Communities in that state as well as Iowa and South Dakota remain under a flood warning for rain and snow melt Friday. “Flooding of small streams and poor drainage urban areas continued over far southeast South Dakota, northeast Nebraska and northwest Iowa. Frozen ground and high water levels in main river systems was slowing the decrease in floodwaters in many locations,” the National Weather Service said. 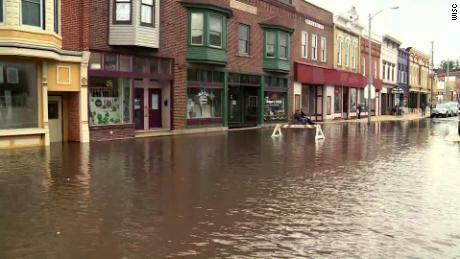 Southern Wisconsin towns also battled high waters and a flood warning in effect till Saturday morning. 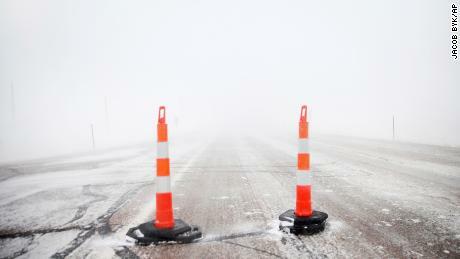 The region is experiencing road closings as a result of flooding caused by the snow melt, rainfall, frozen ground and ice jams, the weather service said. In Fond du Lac, flooding was occurring on the Fond du Lac River due to an ice jam, forecasters said, while other areas affected included Lodi in Columbia County, Darlington in Lafayette County, Prairie du Sac in Sauk County and DeForest in Dane County. The intense bomb cyclone that brought blizzard conditions to the region was moving into Canada on Friday. Dangerous weather conditions were expected for millions who are under some sort of watch, warning or advisory as it heads east and then north. A bomb cyclone occurs when there is a rapid pressure drop, with a decrease of at least 24 millibars — a measure of atmospheric pressure — over 24 hours. This storm dropped 33 millibars from Tuesday into Wednesday. “Although the focus of the bomb cyclone was clearly on the blizzard side, the area east of the low picked up significantly heavy rains on top of existing snowpack and frozen ground that was unable to absorb any of the rain and water runoff,” CNN meteorologist Chad Myers said. The storm’s heavy rainfall has caused major flooding and damaged roads and bridges in Iowa, Nebraska and Missouri. Nebraska Game and Parks Commission employees used a fan boat to rescue residents in Gretna. The Mead Fire Department was helping people near Horseshoe Lake. The Columbus Police Department warned residents to stay away from the Black Bridge. One person is believed to be missing in Boyd County when a dam collapsed and a house was washed downstream. CNN’s Dave Hennen, Monica Garrett, Eliott C. McLaughlin and Nicole Chavez contributed to this report.